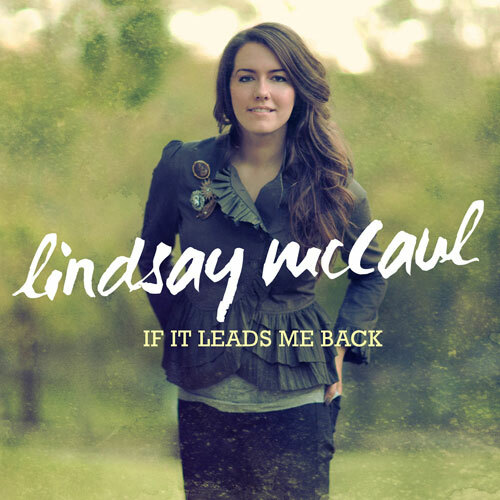 Hailing from Chicago, Lindsay McCaul has just released her debut album 'If It Leads Me Back'. The singer/songwriter's eleven track album was produced by Jason Ingram (Tenth Avenue North, Meredith Andrews), who first brought McCaul's talent to the attention of Reunion Records who went on to sign her. Read More Hailing from Chicago, Lindsay McCaul has just released her debut album 'If It Leads Me Back'. The singer/songwriter's eleven track album was produced by Jason Ingram (Tenth Avenue North, Meredith Andrews), who first brought McCaul's talent to the attention of Reunion Records who went on to sign her. Say My Name is a mid tempo pop song with all the elements of a radio friendly crossover pop song in the making. I think Lindsay has a robust and engaging voice that really adds to the songs on this album. Her voice isn't overpowering and is gentle in its strength. Ready takes the tempo of the album down to a more mellow feel, yet after the first verse the song jumps into the traditional pop/rock anthem chorus that is similar to other artists that are in the same genre as Lindsay. Lindsay McCaul releases this album into a genre of solo pop artists that is actually jammed packed at the moment, and a lot of the albums do tend to be very similar in sound and this album is no different. That doesn't mean it's a bad album, on the contrary it's very good and very enjoyable with tracks like Come To Rest and Take My Hand which are wonderful pieces of music. The latter track is so deeply genuine and heartfelt that you really feel the words Lindsay is singing. Face To Face sounds like it could have easily been recorded and sung by Vicky Beeching, with this mid tempo pop/rock song being about seeing the face of God. Lindsay sings "All I'm waiting for is to see Your face, open heavens door... the moment I see Your face". The summer pop feel jumps out during 'You Never Change', with an acoustic guitar and a bouncy piano beat, it brings those sunny vibes back in during the winter months. This song is about God and from the moment you hear it you know that, but it also feels and sounds like those girly 'I'm in love with a boy' teenage love songs, thankfully the vibe is very different to the true meaning. The album changes to a darker side with Speak and the whispering tone of Hold On To Me. Lindsay's upbeat vocals seem to turn a little softer and gentler during these songs, showing that this vocalist knows how to put over a song with warmth and tenderness. The album for me seemed to get better the longer it went on. The tracks seem to get more creative and not as obvious in sound towards the latter part of the album. With any album people have there favourites, and I'm sure this will be no different on this album. For me the one thing I have taken from this album is that actually this debut is very strong and can only lead onto bigger and better releases.